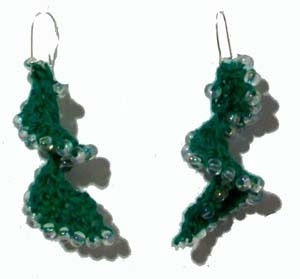 These fun spiral earrings are worked from the outside in on a base of seed beads and have another row of seed beads running down the center. The pattern is fairly simple and good for those who want to branch out into beaded crochet. Start with the How To Crochet: Single Crochet with Beads tutorial if you haven’t crocheted with beads in the past. Finish off. Attach earwire to earring. This entry was posted on Saturday, September 21st, 2013 at 12:00 AM by Candace	and is filed under Free Crochet Patterns. You can follow any responses to this entry through the RSS 2.0 feed. You can skip to the end and leave a response. Pinging is currently not allowed. Adorable. Looking forward to making them. Rachel, cute & what a great quickie Christmas gift! Thanks!